No not the TV show. Although if Alec Baldwin wanted to hang out with me for an afternoon I am sure we could have a great time. He could tell me all about Kim Basinger. I still can’t get that kitchen scene from 9 1/2 weeks out of my mind. Bad Eric! Hey that’s why they call me BadDog! That’s my web design company BadDog Marketing. No the real reason I am writing this blob is to show you my “office”. Not the one I have at home but the one I spend my afternoons at. View from my "office" desk. When people are looking for me and I have my phone off (yes I am ignoring you) while doing some heavy duty coding or Photoshop work they usually pop into my “office” looking for me. Chance are they will find me. 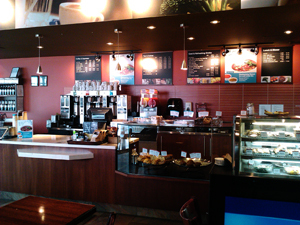 This alternate office is at The Good Earth Cafe – Creekside, Calgary AB. It is run by the nicest family you could ever meet. It’s a true mom and pops establishment. They even have a daughter and son-inlaw as partners. Over the past several months I have made so many friends here. People even trust me to look after their babies! I guess it’s because I am a grandpa and probably look like one. I have met other geeks and we trade industry news and gossip. Even help each other out with a sticky bit of code if possible. During Christmas I organized a Christmas carol evening here at the office. My wife an accomplished pianist, my buddy Herb Huber an amazing guitarist played for several hours. We handed out song books and packed the place out. Check out Herb’s website for inspirational guitar stuff. He teaches as well. As I write this I am at my “office” enjoying the chatter of mothers trading diaper stories, couples laughing at things they only know, and workmen coming in out of the cold for a nice warm coffee. The food here is terrific as well. Yummy sweet stuff and steaming soups. Good Earth Cafe Creekside Motorcyle School vists. 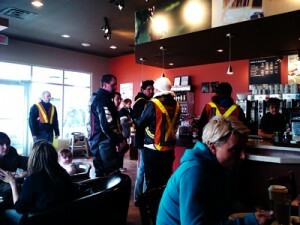 A large group of motorcycle riding students just walked in. Since it’s hovering around zero here (yes it is April, geez) and they have these safety vests on with big L’s on the back. Not sure if that stands for learner or loser. I shouldn’t be so mean. Someday I will probably have to take a course from these guys if I want to start riding again. From what I understand they drop in several times a week with their students which is great business for the cafe. God knows they need it. Business is down for everyone these days. I was in the back room of a big box store the other day and noticed their sales numbers were down from 17 to 23 percent over last year depending on department. People are wisely paying down their debt rather than pumping up their entertainment spending. It’s funny how many of my friends are envious of my ability to work anywhere there is an internet connection. It could be at home, here at the “office”, or on a beach in Hawaii. Years ago an old buddy of mine and I fantasized about buying a diveshop on some beautiful beach in the South Pacific. Now I can have all the benefits of hanging on the beach without the hassle of running a business catering to tourists. Yuk!! Soon I will be off to Turkey for three weeks. My wife and I will be traveling with Dave and Lori-Lynn Brookwell. Dave and Loo-Loo are both professional photographers who run Illusions Studio and Design here in Calgary. I’m biased but I feel they do the best work in town. Maybe I will open an “office” in Istanbul, somewhere with a view of the Bosporus, sipping Turkish tea, watching the gals stroll by……..